The COoperative Unmanned Ground Attack Robots (COUGAR) is a technology effort to investigate and demonstrate multiple unmanned systems cooperating for the purpose of delivering lethal fires. 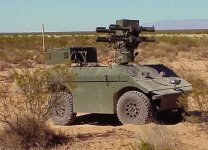 As such, the COUGAR is not a system, but a lethal capability that could transition into a variety of unmanned system programs including the FCS and Gladiator. The COUGAR program uses a simulate-experiment-simulate technical approach. Force-on-force simulations are incorporated into to the program to determine the optimal mixture of vehicle platforms and weapons that can accomplish specific missions. The simulations support the development of system requirements such as the minimum distances between the Command Vehicle, the Killer Robot, and the Hunter Robot. The simulations also determine the necessary performance characteristics of the weapon system and the UAV. The simulation results lead to the development of a set of demonstration requirements. A demonstration system is then built and tested. During the demonstration, data is gathered concerning human factors and technical solutions. The results of the demonstration are then fed into the next round of simulations. Phase I of the COUGAR project was completed in FY01. 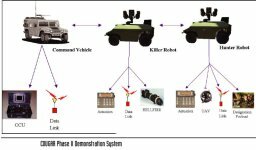 During Phase I, a XUV based robot with a RSTA package and a Javelin missile were simulated. A demonstration of the Phase I system was completed with the successful launch of both 19 Light Antitank Weapon (LAW) rockets and 1 Javelin missile. Phase II of the COUGAR is currently under way. The COUGAR Phase II demonstration system is composed of a command vehicle that will host the Operator Control Unit and a single operator. 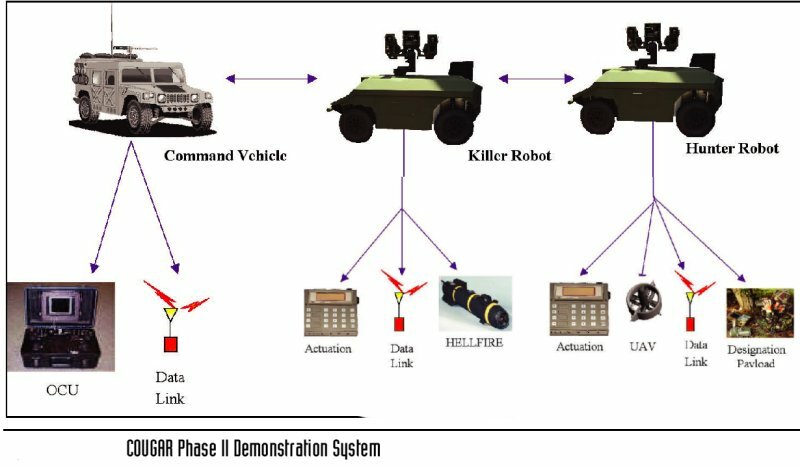 The Killer Robot will be a XUV-based robot that will carry HELLFIRE missiles. The Hunter Robot will be a XUV-based robot that will carry a day/night reconnaissance payload, a laser designation system, and an organic Unmanned Air Vehicle (UAV). The organic UAV will be the Compact Air Vehicle - Shooter Linker (CAV-SL) being developed under an Army Aviation and Missile Command 6.2 program. Before launch, the operator programs the CAV-SL's flight path. During flight, the operator monitors the aerial imagery. In the demonstration, a single operator will control all three unmanned systems. The operator will place the Killer Robot in convoy mode. In convoy mode, a robot will trail behind a lead vehicle. The operator will then teleoperate the Hunter Robot, with the Killer Robot convoying, to a firing point. The operator will then take the Killer Robot out of convoy mode and place it in a firing position. The Hunter Robot will then be teleoperated forward to a reconnaissance position. The operator will launch the UAV to perform aerial reconnaissance and begin to search for targets using both the UAV and the Hunter RSTA package. Upon finding a target, the operator will designate from the Hunter. The operator will then launch HELLFIRE from the Killer. The target will be confirmed as killed using the UAV and the Hunter RSTA package. 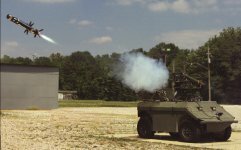 COUGAR is an outgrowth of an Aviation and Missile Research, Development, and Engineering Center (AMRDEC) 6.2 program called Robotic Applications for Modular Payloads (RAMP). RAMP was a technology project designed to investigate technologies that support dynamic plug-and-play payloads. The warfighter is then able to reconfigure a robotic system for a different mission simply by swapping payloads. The robotic systems will identify the payload and configure the OCU to support that payload. COUGAR still has supporting funding from the AMRDEC. 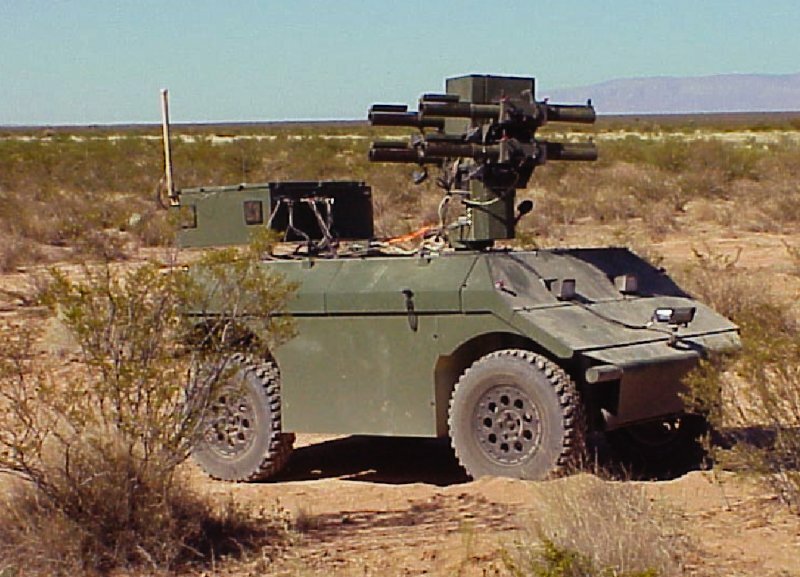 The UGV/Joint Project Office and the U.S. Army Aviation and Missile Command's Research, Development and Engineering Center jointly funded the COUGAR Phase II demonstration that was conducted in December 2002.